MIDTOWN, Manhattan (WABC) -- George Pugh lives in a men's shelter in Bed-Stuy, so he knows a thing or two about hard times. Now, Pugh is a hero, and he may well have saved lives with his quick work on Wednesday night. 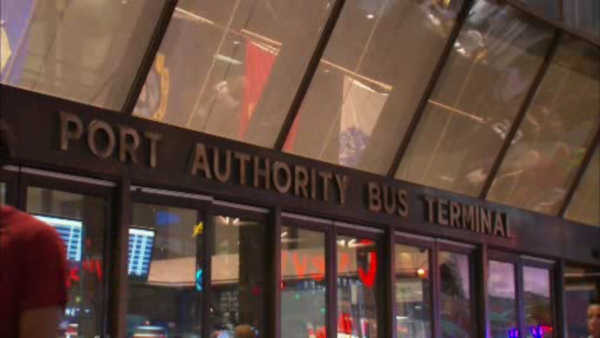 Pugh was hanging out at Port Authority on Wednesday talking to Hunter Lee Taylor of Grroveland, Florida, who was waiting to board a bus heading to Boston. When two Port Authority police officers walked by, Taylor allegedly made a reference to shooting the police officers, and showed Pugh a .38 caliber handgun. Pugh walked away and alerted police, who arrested Taylor and confiscated the gun, loaded with hollow point bullets, in court for his arraignment Thursday night. The prosecutor said he was 'going to kill someone'. Taylor is wanted in Florida, and was held on $250,000 cash bond. He is just 18 years old.